There is a basic ratio of these three doshas for every human body, which is fixed from the time of birth. This ratio gives us our uniques body type. Ayurveda calls this ratio as “Prakruti”, which is a Sanskrit term for ‘Nature’. Whenever your doshas are affected by doet, lifestyle, weather or environmental factors, they get imbalanced. Imbalance of doshas is called “Vikruti” which is the Sanskrit for ‘Abnormality’. 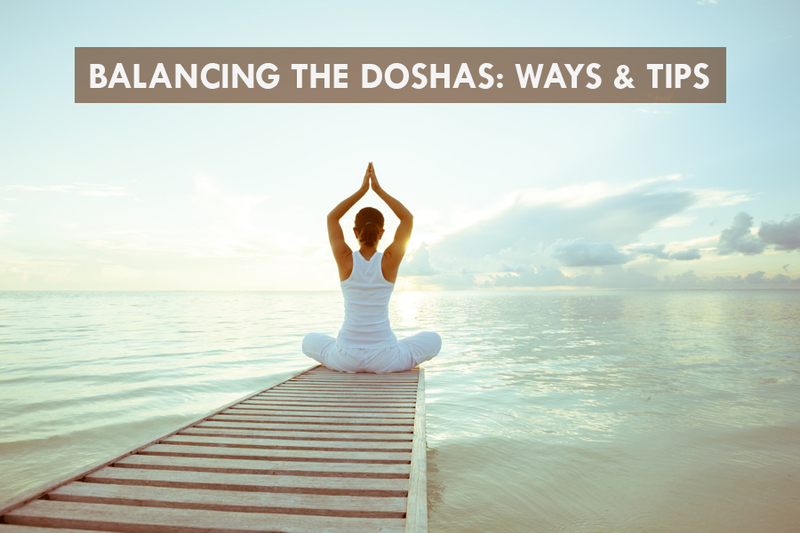 Let’s go through some aspects of diet and lifestyle to harmonize the doshas to stay balanced. – Meditation, Yoga and sound sleep. – Eat warm, colourful and flavourful diet. – Give importance to sweet, sour and salty flavour. – Include adequate ginger and cinnamon in the diet. – Massage yourself with sesame oil or vata balancing herbal oils or consult your personal masseuse. – Avoid exposure to cold weathers and droughts. – Me time or hobbies. – Keep a daily routine of meals, exercise, rest, meditation and sleep. Pitta is often connected to the metabolic and digestive systems and hormones. Follow these steps for a balanced pitta. – Be vivid in whatever you are doing. Leisure and fun games can eliminate stress and thereby bring pleasantness. – Include cold food in your diet. Let sweet, bitter and astringent tastes excel. – Limit hot, spicy and very salty foods. – Bitter is always better. Cooling and bitter herbs such as Mint, Coriander, Fenugreek and Neem help a lot. – Quit consumption of alcohol, recreational drugs and coffee. – Consume adequate quantity of fresh water. – Go for walking and swimming. – Yoga also helps a lot in balancing Pitta. – Eat light, dry and less oily food. – Include bitter, pungent and astringent food in the diet. – Spices such as garlic, ginger, mustard, black pepper, and chilli are good to control kapha. – Practice yoga and intense exercises. – Conditional fasting is effective. Restrict meals to two times a day. – Control the quantity of sleep. Avoid sleeping immediately after meals and during the day. – Eating for emotional comfort invites kapha imbalance. – Stop spending time in air-conditioned spaces. – Limit the intake of salt and sugar. Dr Rafeena offers a thorough and hassle-free consultation, which will help you to understand your body imbalance. Through proper herbal medications, therapies and detox therapies, the dosha imbalances can be corrected.